My recent cravings for salty and savory foods, due to my intensive marathon training, have brought me back to seaweed. These days, I can have seaweed as early as breakfast time. As long as you have it, no matter when, it can only be good for you. Here are some facts: Seaweed contains the broadest range of minerals of any food. It contains considerable amounts of iron AND vitamin to make the body absorb it. Seaweed is anti-inflammatory, anti-cancer, anticoagulant, antithrombotic, and antiviral. A superfood, in other words. I made my old, traditional seaweed salad, the salad that my husband thinks made me fall in love with him. I imagined that the dried wakame would be good in crackers too. Husband was already complaining about the almost empty bowl of crackers that he loves to tuck in to after work. 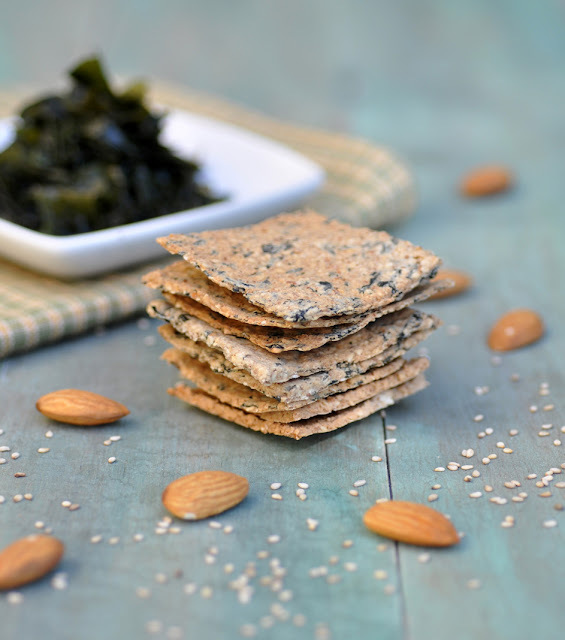 My buckwheat almond crackers have been my most successful recipe so far. So I decided to throw the seaweed into those. A true success. Even my daughter likes them as the seaweed only comes through as a subtle note. She didn't like the salad, which I didn't expect children to like. I am happy she like the crackers. I think one can never try enough get the kids used to GREEN edible foods. Mission completed: recipe successful, husband is feeling loved and daughter eating her green veggies. Now I just need to make sure I get my share. It was me, who was craving seaweed in the first place! Combine flour, almond meal salt and dried seaweed in a food processor. Pulse until seaweed is finely chopped. Transfer to bowl. Stir in sesame seeds. Add water and knead until well combined. Cover the bowl and let sit for 10 minutes or so. With a knife or cookie cutter, cut the dough into desired shapes. Poke each cracker with a fork to prevent puffing. Transfer onto baking sheet (with bottom parchment paper). Bake for 20 to 30 minutes or until edges turn golden brown. Remove from the oven and let cool. Break crackers at pre-cut edges. Serve immediately or keep in open bowl.